and push updates and revisions instantly. Manage all of your listings on ezimerchant, any changes you make will automatically be pushed to your items on eBay. ezimerchant generates attractive and professional sales templates and descriptions for your listings automatically. Effortlessly create listings in bulk for thousands of products. Import from your favourite spreadsheet program and watch ezimerchant push your changes to eBay. Selecting the right category for your listing has never been easier. ezimerchant makes it easy to list in the categories that will be seen by the most eBay users. Stop dealing with listings. Let ezimerchant manage them for you. your sales and products before they go out of stock. Need to relist an item? 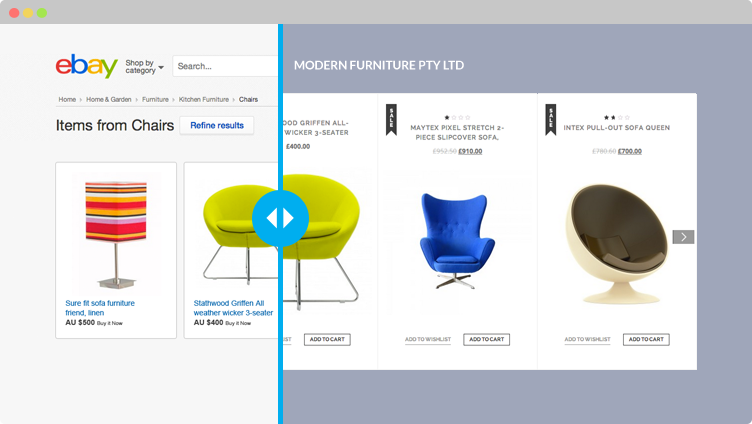 New listings will automatically be relisted using the latest information from the product catalogue in ezimerchant. listings and spreadsheets. Manage your entire inventory with ezimerchant and well do all the hard work for you. products to GetPrice, Myshopping.com.au, Shopmania and more! you already use to sell and track your sales. Risk free, no credit card required! We are currently creating your account. This may take up to 25 seconds. Our introduction wizard will guide you through. You will now be redirected. You will be asked to sign in and/or authorise ezimerchant to create your account. Tip: Sign up to eBay via our wizard to make sales sooner.